Dan was the love of Julie’s life and when he died, she fled her once happy home, escaping both the place and her memories. When Julie left her home, she ended up in a mysterious place called Runaway in an even more mysterious house. There, she met the ghost of a woman named Lilli. Under Lilli’s direction, Julie saved Lilli’s grieving husband, Dale. They grew closer than expected, but he soon died leaving her with a surprise: Julie was pregnant with his child. Now, an old friend invites Julie back to the house in Runaway to watch over its remains. Julie agrees to return, knowing Lilli still walks the property, but soon realizes Dale is there as well. 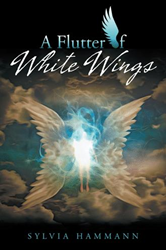 The book is available for purchase at: https://www.amazon.com/Flutter-White-Wings-Sylvia-Hammann/dp/1504316819.